A mass of paeonia colour. 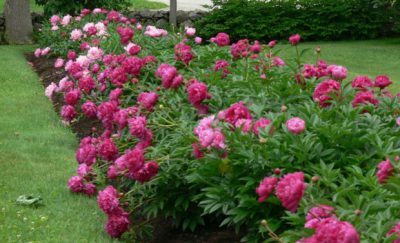 Nothing says mid-summer exuberance in the garden quite like peonias, whether the herbaceous or the shrub/tree paeonia, their fleeting beauty is to be embraced and celerbrated. Here are just a few suggestions. 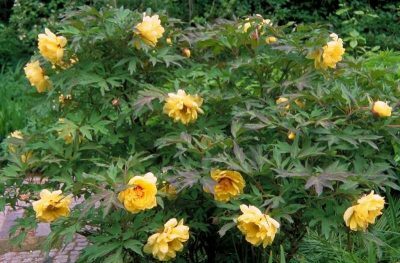 Paeonia delavayi f. lutea: This wonderful tree paeonia, it may be a little on the slow side but it is worth the wait. A great addition to the back of the border. Tall up right steam reaching to 2m or above, in dense thickets, with new growth of red stems and deeply cut leaves. Large tea-plate size sulphur yellow flowers are born freely from late May into June. 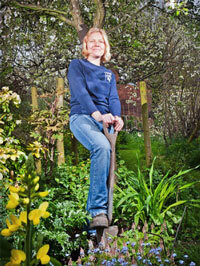 Grow in full sun and it will be happy in free draining soil from acid to alkaline. 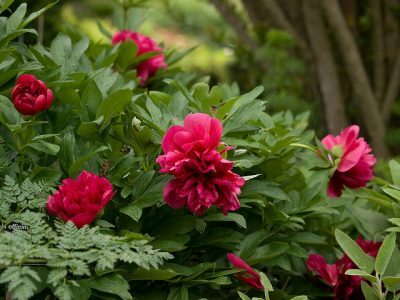 Paeonia officinallis Rubra Plena: Perhaps the most common of garden grown paeonias, this herbaceous paeonia grows to 60/75cm tall, making a sturdy upright clump, with mid green leaves. These crimson double flowers are a splash of colour for the middle of the border. Flowering May to June. Full sum well drained soil. Paeonia lactiflora Bowl of Beauty: herbaceous paeonia a strong grower to 80cm/1m tall. Mid green foliage. Large sugar pink open flowers with clusters of creamery white central petals, make this a show stopper for any planting scheme. Flowering June to July. Full sun and well drained soil. 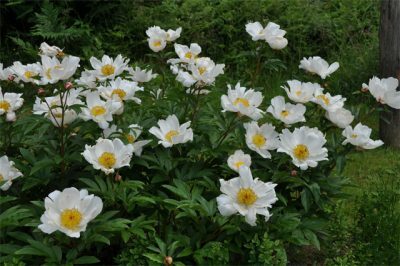 Paeonia ‘white wings’: this wonderful elegant herbaceous paeonia with dark green palmate foliage has large open dinner plate single flowers with delicate almost paper like white petals and a mass of golden stamnes at it’s cemtre. Flowering June. All good drained soils full sun. 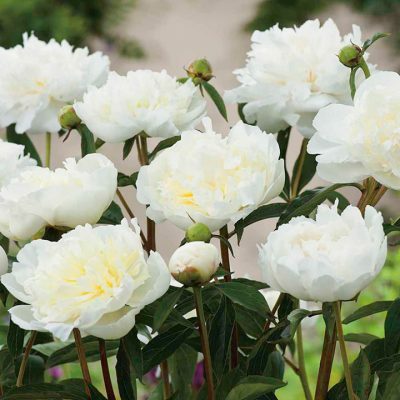 Paeonia lactiflora ‘Duchess de Nemours’: This old garden classic adds a touch of elegance to the mid summer border a stand of stems up to 1m tall with glossy mid green foliage. Large cup shaped flowers of creamy white are freely born from June to July. They may have gone a little out of fashion in recent years, considered to be a bit ‘blousy’ and fleeting, but I would argue they are a spectacular addition to any mid- summer planting scheme, whether used in a modern block planting along side grasses and over fashionable long lasting perennials or in a more classic traditional planting, they earn their place. 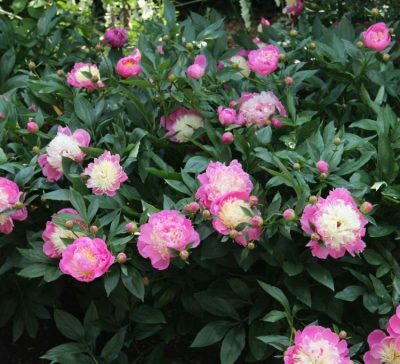 The Japanese revere them with Paeonia festivals, but perhaps we can just start to plant them again. 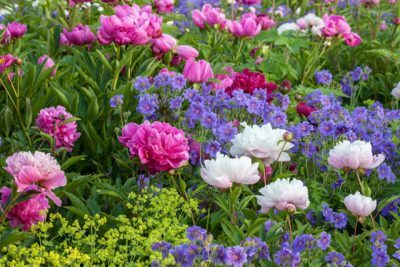 This entry was posted in Gardening News, Gardening Thoughts and tagged Paeonia on May 1, 2018 by Emily.